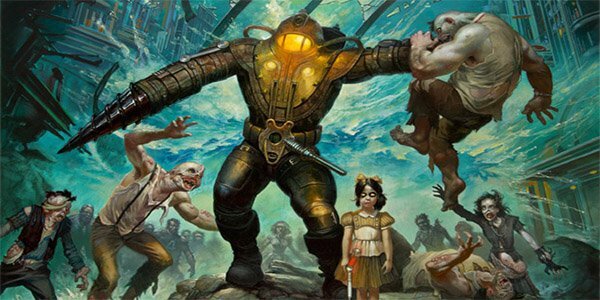 2K Games recently unveiled plans for the BioShock: Ultimate Rapture Edition which is set to release on January 14, 2013. The package will bring together BioShock and BioShock 2, along with all of the content and add-ons from both. If you’ve been cautiously dipping your toes into the water and waiting for the right time to dive in, now’s the time. Plasmids Pack: Includes four additional Plasmids and Gene Tonics — Sonic Boom, EVE Saver, Vending Expert and Machine Buster — for use in BioShock. Challenge Rooms Pack: Previously exclusive to PS3™ and now available for Xbox 360 for the first time, the pack tests the player’s mettle by requiring them to utilize the skills learned while traversing the halls of Rapture to survive three separate puzzle rooms in BioShock. Also included, is an exclusive collectable sticker pack from BioShock Infinite’s world of Columbia to get gamers ready for the next chapter in the BioShock universe. Gamers will be able to pick up the Bioshock: Ultimate Rapture Edition for $29.99 on both the PS3 and Xbox 360. Is this new package worth it, or is it just a way for 2K Games to wring the world of Rapture dry before Bioshock: Infinite? Make your voice heard in the comments below.